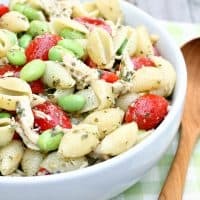 CHICKEN PESTO PASTA SALAD — Chicken, tomatoes and edamame are combined with shell pasta and tossed with basil pesto in this simple but delicious salad. I don’t know what the weather is like in your neck of the woods, but things are still pretty hot here in Colorado. Fall might be right around the corner, but it’s still that time of year when I don’t want to turn on my oven! So I turn to easy, no-bake meals like this Pesto Chicken Pasta Salad to keep things cool in my kitchen.This savory pasta salad is so easy to put together. 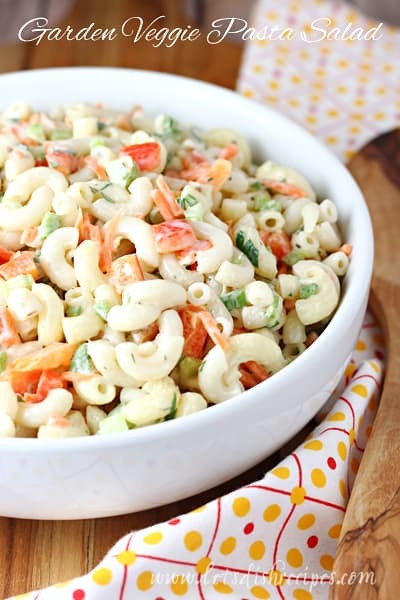 In fact, I think it’s one of the easiest pasta salad recipes I have! 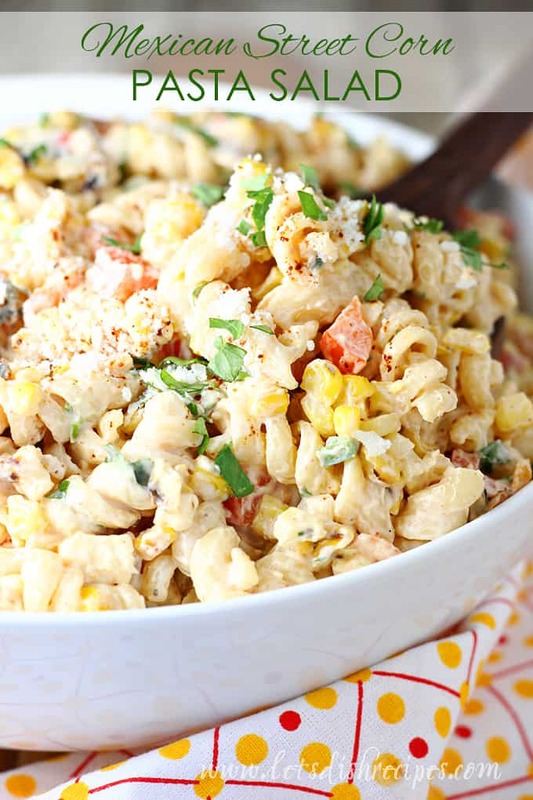 My husband, who is something of a pasta salad connoisseur, counts this as one of his favorites. Come to think of it, everyone I’ve ever served it to has loved it! Pesto is a great dressing for pasta salad, because it’s already loaded with so many great flavors. And if you plan to take your salad to a backyard barbecue or on a picnic, you don’t need to worry like you would with a mayonnaise based dressing. This salad is perfect for adapting to use whatever veggies and fresh herbs you have on hand, so don’t be afraid to make substitutions. You can add any of your favorite herbs and vegetables. Which is especially great if you happen to have a garden full of fresh veggies! I just love all of the beautiful colors and great flavors in this salad. It’s the perfect solution for those hot summer days when you just don’t feel like cooking. With some crusty bread, it makes a perfect light dinner, and the leftovers are great for lunch. 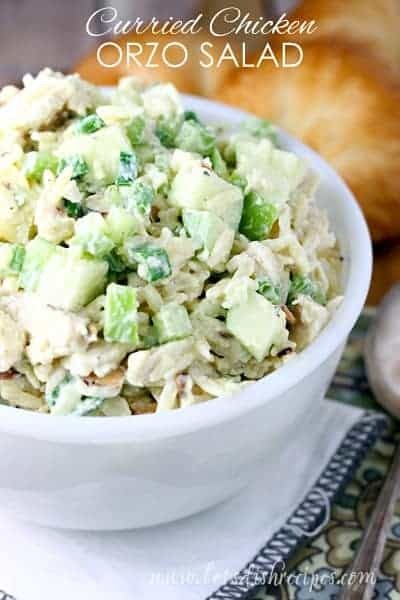 Be sure to save this Chicken Pesto Pasta Salad recipe to your favorite Pinterest board for later. 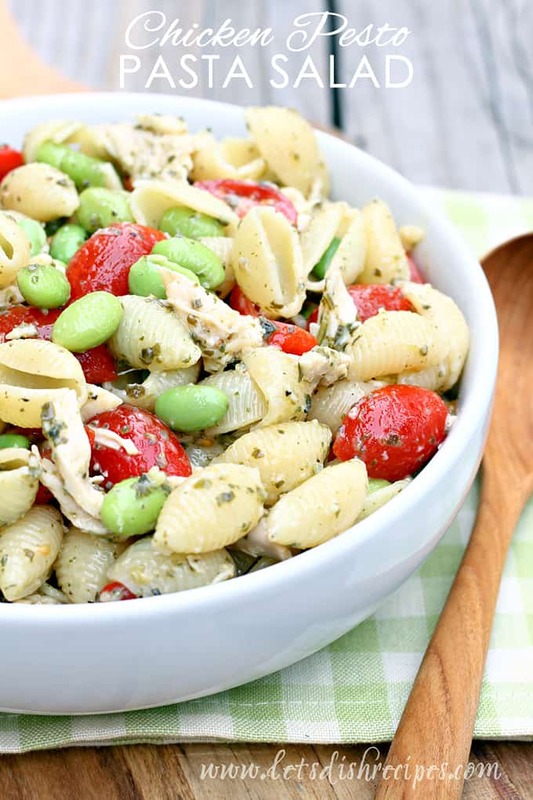 Chicken, tomatoes and edamame are combined with shell pasta and tossed with basil pesto in this simple but delicious salad. 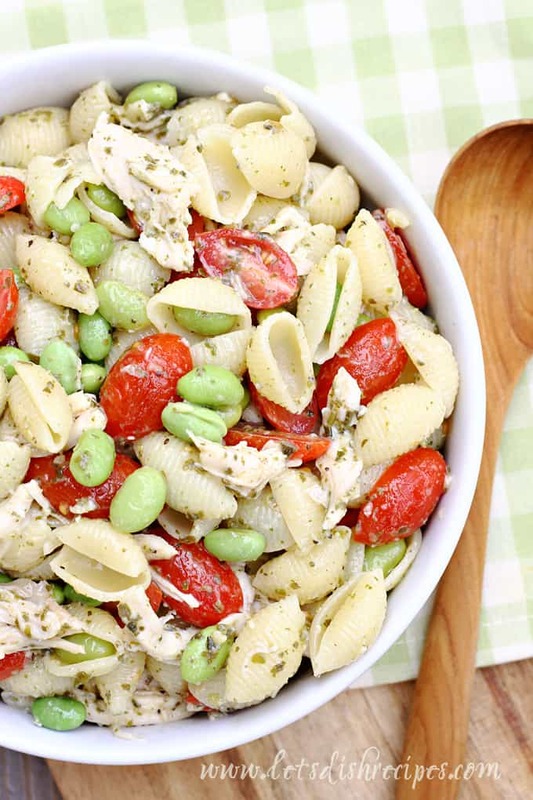 Add chicken, tomatoes and edamame to pasta and toss together. Add pesto and toss until well combined. Season with salt and pepper, to taste. Refrigerate until serving. Add additional pesto and seasonings just before serving, if desired. This recipe was originally published at Eigteeen25.